Family Fights Sale Of Iconic Thomas Cole Painting While serving as governor of New York, William Seward received a Thomas Cole landscape painting as a gift for his work on the Erie Canal. Since then, its value has exploded and its caretakers are looking to sell. On Tuesday, Seward's great-great-grandson will be in court to try to stop them. A celebrated 19th century landscape painting by Thomas Cole is at the center of a 21st century fight: The Seward House Historic Museum in upstate New York wants to sell a painting that belonged to former Secretary of State William Seward, but on Tuesday Seward's great-great-grandson will be in court to try to block the sale. If you saw the movie Lincoln then you saw Seward — played by David Strathairn, who bears a striking resemblance to his real-life character — doing Abraham Lincoln's dirty work. After serving as Lincoln's secretary of state, Seward moved back to the family's mansion in upstate New York. Today, the Seward House Historic Museum in Auburn, N.Y., houses 15,000 items, including books, furniture and artworks, that belonged to Seward and his heirs, but its most famous piece is no longer on display. Portage Falls on the Genesee, a major work by the 19th century landscape painter Thomas Cole, was given to Seward when he was governor of New York. 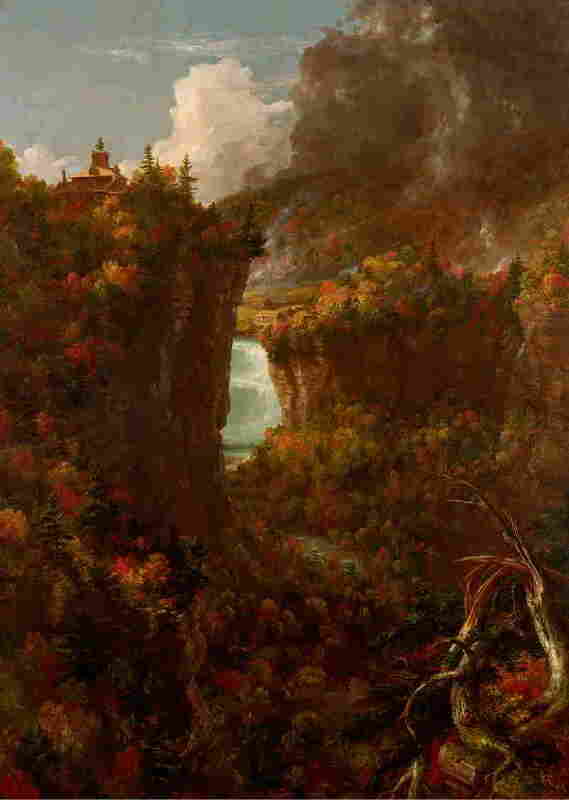 Thomas Cole completed Portage Falls on the Genesee in 1839. "It's probably the centerpiece of the house," says Ray Messenger, Seward's great-great-grandson. "Most people who come and know anything about Thomas Cole, the minute they see it go, 'Wow.' "
It's a huge painting — roughly 7 feet by 5 feet. Cole traveled to the Genesee Valley to document the natural beauty of the gorge before industrialization threatened to change it forever. The painting hung in the Seward family house for 150 years, until February 2013 when it was quietly removed to an undisclosed location. "We're not set up to house a world-class masterwork in the museum," says Seward House Historic Museum President Daniel Fisher. "It's a historic house museum, and it would not be appropriate for us to keep it." Museum officials are worried about protecting the painting, in part because its value has exploded. 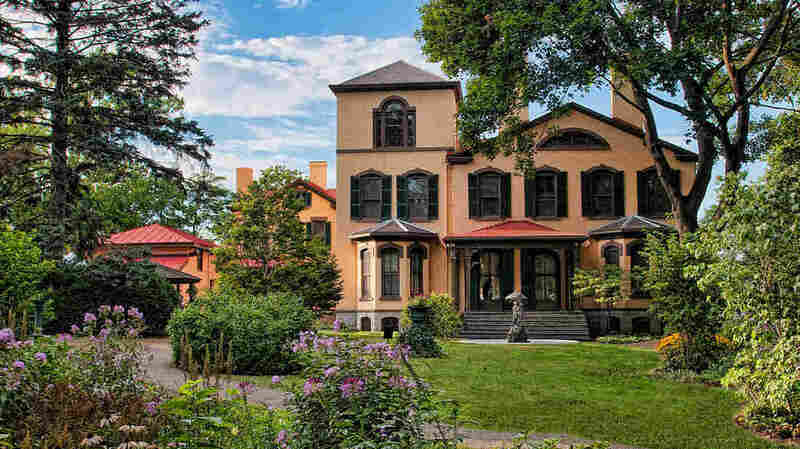 In 1951, it was said to be worth $100; in 2007, it was appraised at $20 million — more than five times the rest of the Seward estate combined, according to museum officials. So a few months ago, they announced their intention to sell the painting. Messenger was president of the Seward House's board until 2009. Even so, Seward's great-great-grandson says he was shocked when he heard about the decision to sell. "I couldn't believe it," he says. "It had been talked about, rumored. But I didn't think they'd do it." Museums are discouraged from selling off pieces of their collections unless they're using the proceeds to add to those collections or help preserve them. But those rules don't apply here because, technically, the museum doesn't actually own the Cole painting. Back in the 1950s, William Seward III — Secretary Seward's grandson and Messenger's great-uncle — made an unusual arrangement for the house and its contents: He left them to a local charity created by his friend, a wealthy industrialist named Fred Emerson. Tony Franceschelli is the president of the Emerson Foundation, a charitable organization with about $75 million in assets. He says the foundation has provided much of the Seward Museum's operating budget ever since the bequest. In 2008, the house and most of its contents were officially spun off into a new, independent organization, but the Emerson Foundation held on to the Cole painting. According to Franceschelli, his organization and the Seward House Historic Museum have agreed on a plan to sell the painting and split the proceeds. "It wasn't an easy decision," he says, "but it's the best thing for the Seward House and the Seward legacy to remain viable for future generations." Seward's great-great-grandson doesn't agree. On Tuesday, Messenger's lawyers will ask a judge to make him the administrator of his great-uncle's estate — the first step toward a lawsuit to block the sale. Messenger says the painting was a gift to Seward for his work on the Erie Canal when he was governor of New York and it won't have the same power anywhere else. "It's emblematic of what Seward's work was as governor," he says. "This painting just kind of grabs all of it and sums it up. A picture is worth 1,000 words; in this case it would be true." Whatever happens with Messenger's case, the sale of the painting still has to be approved by a New York court. Still, Messenger echoes his great-great-grandfather's most famous speech about slavery when he says there is also a "higher law," one he believes is on his side.